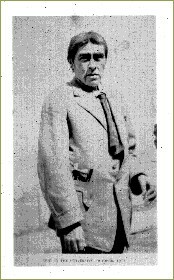 In August of 1911 a starving native-American man walked out of the Butte County wilderness into Oroville and became an instant journalistic sensation. 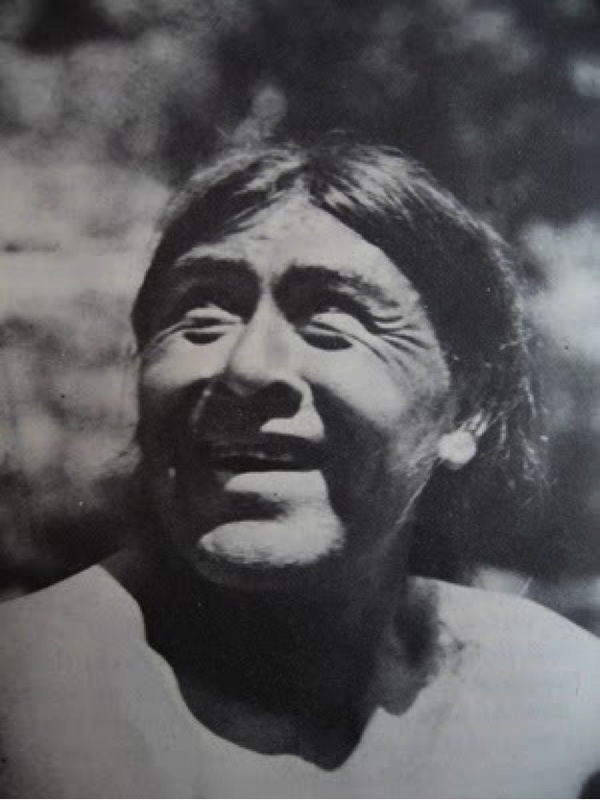 He was identified by UC anthropologists Alfred Kroeber and T. T. Waterman as the last of a remnant band of Yahi people native to the Deer Creek region. 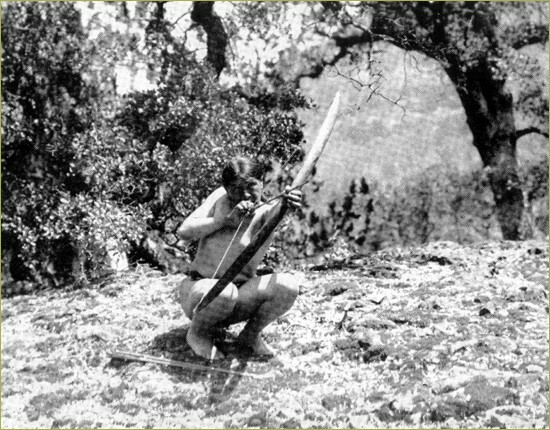 The UC anthropologists immediately went north to Oroville and brought him back to live on the Parnassus campus, giving him the name “Ishi” which meant “man” in the Yahi language. 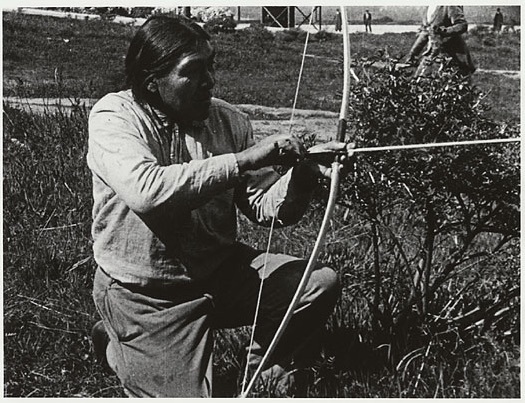 During the next four years, the anthropologists and physicians at UC would learn much from Ishi, as he demonstrated his toolmaking and hunting skills, and spoke his tribal stories and songs. 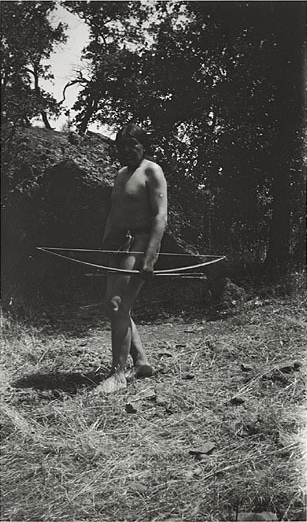 Newspapers frequently referred to Ishi as the “last wild Indian,” and the press was full of anecdotes referring to Ishi’s reaction to twentieth-century technological wonders like streetcars, theaters, and airplanes. 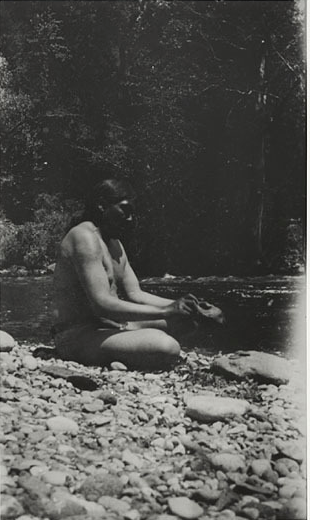 In his writings, Waterman respectfully noted Ishi’s “gentlemanliness, which lies outside of all training and is an expression of inward spirit,” and the records of the time reveal much mutual respect on the part of Ishi and his scientist-observers. 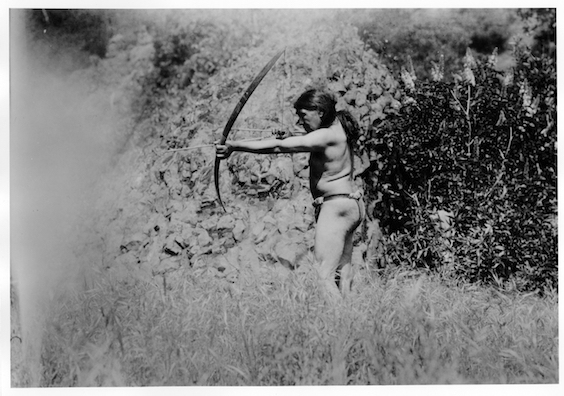 Each weekend, hundreds of visitors flocked to Parnassus to watch Ishi demonstrate arrow-making and other aspects of his tribal culture. 1840s: Approximately 400 Yahi people exist in California; total Yana peopleestimated at 1500. 1849: California Gold Rush begins. Ishi’s birth ca 1860. 1865: The massacres of Yahi People begin, 74 killed. 1866: Three Knolls Massacre, 40 killed; Dry Camp Massacre, 33 killed. 1871 Kingsley Cave/Morgan Valley Massacre 30 killed. 1870-1911: Period of Concealment: a remnant band (five to twenty individuals) of Yahi hide in the Mill Creek area. November 10,1908: Surveying party surprises a band of four; Ishi escapes and hides; out of curiosity the surveyors take tools and artifacts from the camp. October, 1910: T.T. Waterman leads an expedition into the Mill Creek area to attempt to find the lost band of Indians, finds “incontrovertible evidence of their existence in a wild state.” No contact made. Game was nearly always shot while standing still, although an occasional rabbit was shot o running. 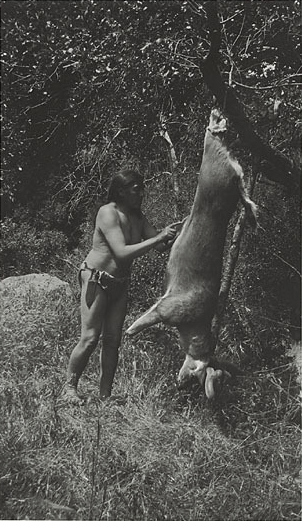 He would eat no fish on the day prior to the hunt, because the odor could be detected by deer. His method was that of still hunting; walking, over the ground very quiet and alert, always paying particular attention to wind, noise, and cover. 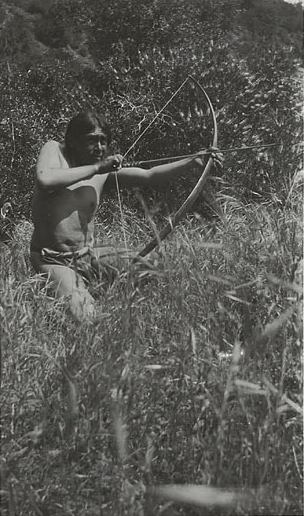 In hunting deer, Ishi used the method of ambush. His system of shooting was as follows: Taking his bow from the quiver, he placed the lower end on his partially flexed left thigh. While he held the bow by the center with the left hand—its back was down—his right hand caught the string between forefinger and thumb. The arrow was called sawa. 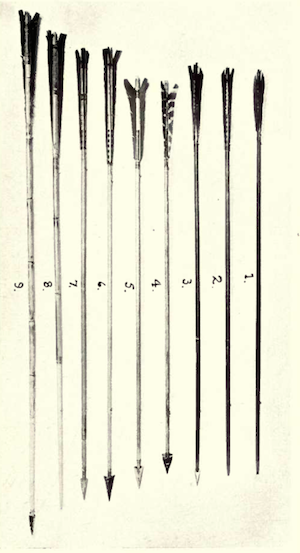 Of all the specimens of arrows in the University Museum, scarcely any show such perfect workmanship as those of Ishi. His proportions and finish are of very high order. When upon a prolonged hunt, Ishi carried as many as sixty arrows with him, though his quiver seldom contained more than a score. The extra arrows he kept covered with a skin and bound with buckskin thongs, and he carried them slung over his shoulder. 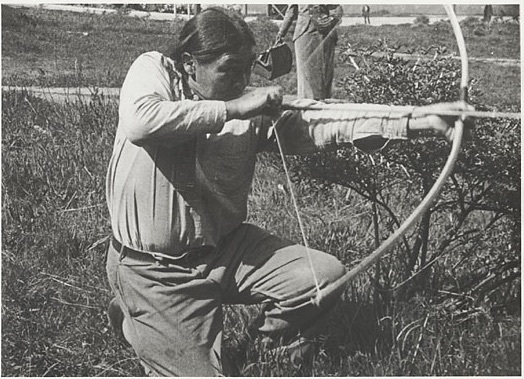 Ishi called the bow man'i. 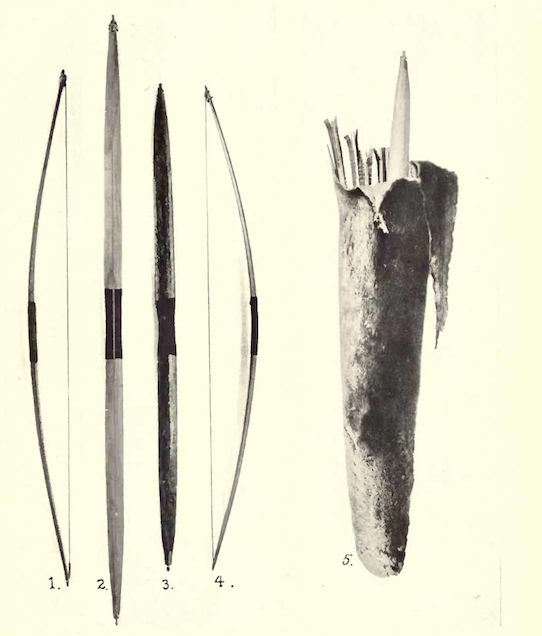 He made bows of many woods while under observation, but upon an expedition into his country three years after his capture he showed us the tree from which the best bows were made. It was the mountain juniper. He made a stave from one of these trees on the spot, though it was later ruined.